In The Media — Storm It, Win It! Sam Shaffer owner of Titanium Archery Products. Storm Elazar Launches “Storm It, Win It!” YouTube Channel. 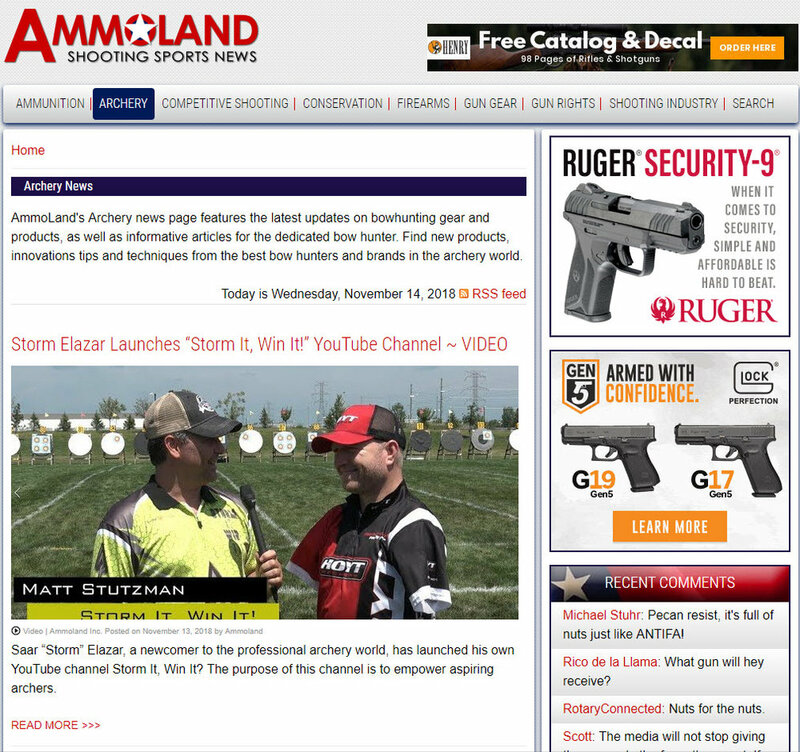 Brooklyn, New York – -(AmmoLand.com)- On November 5th, 2018, professional archer Saar “Storm” Elazar launched his own YouTube channel Storm It, Win It. The concept, created by Elazar, grew from the idea that by storming something any goal you set is within reach. Storm It, Win It is symbolic of Elazar’s own journey to become a professional archer. Two years ago, at age 41, Elazar visited Proline Archery Lanes looking for an activity he and his daughters could do together. What he found was his passion, and from the moment he shot that first arrow, Storm Elazar knew he wanted to become a professional archer. Throughout his journey to become a professional archer, Elazar interviewed members of the archery community who inspired him and helped him get his start. In the first video for Storm It, Win It, Elazar interviewed Matt Stutzman, a Paraolympic silver medalist and world-record holder for the longest accurate shot in archery. Stutzman, who was born without arms, adapted to his condition so well that he is a fierce competitor even when compared to able-bodied archers. Stutzman was one of the first archers Elazar came across when he began to study the sport. His story served as an inspiration for Elazar, and not just because he admired Stutzman’s work ethic and tenacity. In comparison to the obstacles Stutzman has overcome things like age and experience barely mattered when it comes to success. Storm It, Win It is Storm Elazar’s way of sharing his passion for archery with others. In just two years, Elazar has gone from learning the ropes to being nationally ranked by USA Archery. When asked about the motivation behind Storm It, Win It¸ Elazar says its just as much about showing people archery is for everyone as teaching them how to shoot. Storm was kind enough to let Eyewitness News tag along with him to Pro Line Archery in Queens, where he showed us first hand how it's done, and as is often the case, I showed how it's not. OZONE PARK, Queens (WABC) -- It's a sport that seems as old as time itself. Need proof? The earliest people known to have used bows and arrows were the ancient Egyptians, who adopted archery at least 5,000 years ago for purposes of hunting and warfare. Movies like 'Robin Hood' and 'Rambo' helped make it popular today, as has the Olympics, where Archery first debuted back in 1900. A little closer to home, NYC's own Storm Elazar has taken up the pursuit of becoming a professional archer. His quest began some two and a half years ago, and has progressed to the point now where he is the 50th ranked archer in the U.S. today. Not bad, right? NEW YORK (WCBS 880) -- A Queens man has decided not to let age get in the way of his passion, and is on a path to realize his dream – using a bow and arrow. Jack Denley is a pro who is among those helping Elazar with the quixotic dream. “He is doing something that nobody has done before,” Denley said of Elazar. Elazar came to Pro Line to have something do with his daughter, and she kind of liked it. But it became his passion. “It’s a destiny. It’s really a destiny that when I shoot, I feel this is what I’m supposed to be doing,” he said. “At a late age, it’s very difficult,” Danley said. “The stamina; you have to do a lot of training.” You need upper body strength, hand-eye coordination, endurance, and passion. Of that Elazar has an endless supply. “They say if there’s a will, there’s a way, and that’s my will, and this is my way to do it,” Elazar said. “I’m 43, but I feel like I’m 17,” Elazar said. His goal is to make pro by the Lancaster Archery Classic in January, and he knows at this point, he has a shot. Storm featured on the "Sweet Spot" with Mike Sugerman WCBS880 News Radio . Always feel good when people take interest in your journey and what you do, when it comes from the media, its even sweeter. . Thank you Mike Sugerman and WCBS880 for this. Brooklyn, New York – -(AmmoLand.com)- Saar “Storm” Elazar, age 43, is on the path to show others that no matter your age, you can shoot for the stars. Two years ago, Storm visited a local archery range to spend quality time with his daughters, sharing an experience with them that he loved as a child. As soon as he shot his first arrow, Storm felt that childlike glee again and knew archery was his calling. “As soon as I opened the door, it was like a movie. Everything clicked into place” says Storm when asked how it felt shooting a bow for the first time in 30+ years. Storm could have kept archery just a hobby, an escape from his daily life in the city. Instead, he decided to pursue his passion and become the best of the best. Storm is training every day, competing against people younger than him with years more experience. That doesn’t discourage him though. He is determined to achieve his goal of becoming a professional archer. After months of training, Storm attended the Lancaster Archery Classic. He then made it his goal to compete as a pro archer the next year. Storm was shooting makeshift bows in his birthplace of Israel while his competitors were training, dedicating their life to the sport. Now, he wants to show that it is never too late to start pursuing your dreams. Storm first competed in the Lancaster Archery Classic in 2016. There, he brushed elbows with the best in the sport, which cemented his goal to compete at the professional level someday. The next Lancaster Classic is in January, and that day is coming soon for Storm. He will be documenting his journey from enthusiast to professional over the coming months. Storm isn’t just in it to win it. He wants to show others that the only obstacle standing between themselves and their goals is hard work, determination, and believing you can do anything you set out to do.